Hotels near Tablas de Daimiel! Are you looking for Hotels at Tablas de Daimiel? In Rusticae we exclusively selected the best hotels at this National Park for the best prices. Visit Hotels, rural country houses or apartments. Enjoy our exclusive offers for Rusticae Hotels and discover the nature! 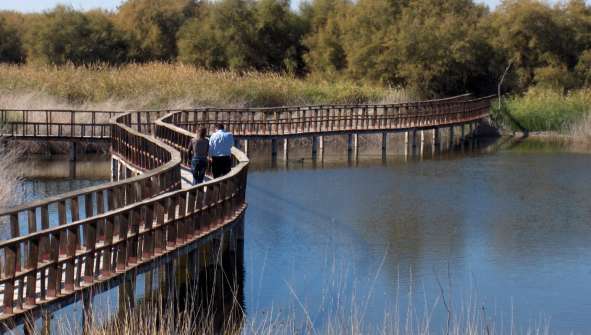 In the province of Ciudad Real, the Tablas de Daimiel National Park hosts a virtually unique wetland in Europe and last representative called wetlands ecosystem, resulting from overflows of the rivers in their middle sections. Thanks to this aquatic habitat you can find a wide variety of flora and wildlife. Discover the natural wonders of the Tables de Daimiel while following any of the proposed routes. The itinerary of the Permanent Laguna leads to a beautiful lagoon in the itinerary of the Pan Island you will find the forest of Tayares, Prado and the itinerary Wide ends in a tower that offers great views. A good base camp to explore the park is the Casa del Rector, 41 km, located in the charming town of Almagro.